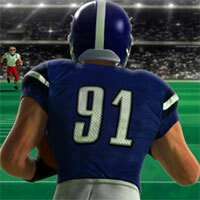 Touchdown Rush is a cool american football game to enjoy online and for free. Control the quarterback trying to dodge all opponents and reach the goal line to pass to the next level. Unlock stage after stage until you’ve mastered the game like a pro. Collect bonuses and try to move quickly from side to side and jump to trick the defense. This game is packed with awesome graphics to make it much more enjoyable, so get ready for a nice football experience. Enjoy and have fun in playing this free online game. Make sure to check out Baseball Hero Game. You may enjoy playing it.